Kent Scott, a teacher from Tecumseh, Okla., holds a protest sign Monday at the state capitol in Oklahoma City. Thousands of teachers and supporters have rallied this week for more money for education. One of them, HB 3375, which passed the state House last month, would allow the state's casinos to add ball and dice games like roulette and craps. That would raise $22 million, the Oklahoma Education Association estimates. Teachers would get another $20 million, according to the OEA, if the Senate closes a tax loophole. A law tacking sales tax onto Amazon orders, which passed last year, did not require third-party vendors to pay the tax. The House passed HB 1019xx, levying the same tax on those vendors, on Thursday. Those funds would be in addition to a law signed last week by Gov. Mary Fallin that gives each teacher a $6,100 raise and commits $33 million to school textbooks and $18 million to additional school funding. Those were funded by a tax increase on cigarettes, fuel and production of oil and gas. But despite last week's bill, teachers began a walkout Monday and flooded the state capitol with protesters. Teachers have complained the state's funds aren't enough to keep up with the cost of textbooks and supplies, and that the state hasn't addressed issues like overly large classes. On Thursday, the state capitol limited the number of people allowed into its rotunda, the Tulsa World reports. But, although it was smaller than in recent days, the crowd chanted, "We're not leaving! We're not leaving!" 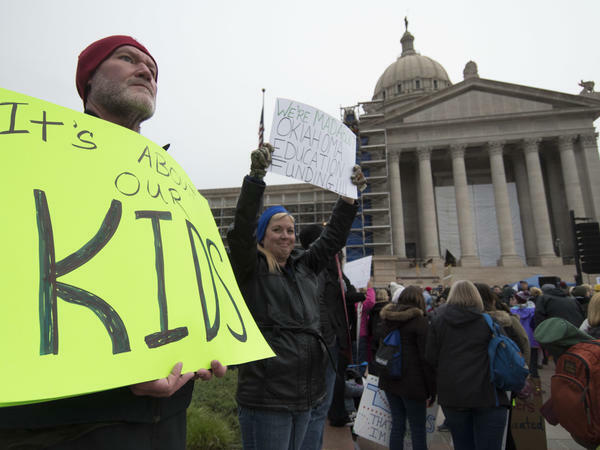 The Oklahoma Education Association hasn't indicated whether passing the bills under consideration would end the walkout. OEA President Alicia Priest said the group had asked for $75 million in new education spending, according to NewsOK, which notes that if passed the current measures would total to $70 million. Lawmakers' opposition to new funds for teachers stems from a reluctance to raise taxes. As Emily Wendler of StateImpact Oklahoma reported, last week's pay raise for teachers was the state's first tax hike in 28 years. Republicans control Oklahoma's legislature. Senate Floor Leader Greg Treat, a Republican, demurred when asked how to end the standoff. "I'm not the one who started the walkout, so I'm not the person to ask," Treat told the AP. Gov. Mary Fallin, also a Republican, angered teachers when she compared their stance to "a teenage kid that wants a better car" in an interview with CBS News. But Oklahoma's teachers may be encouraged by similar walkouts in West Virginia, where teachers secured a pay raise, and Kentucky, where teachers rallied Monday and are threatening to do so again if the state government doesn't meet their demands.